Applications : This is probably the best of a whole trustworthy family of symmetrical bends comprising two interlocked overhand knots. It works even in big stiff hawsers and cables and is suitable for everything from hobbies to heavy industrial use. Method : Rosendahl's tying method is a trifle awkward and so an easier way (1-3) has been devised by Ettrick W. Thomson of Suffolk, England. 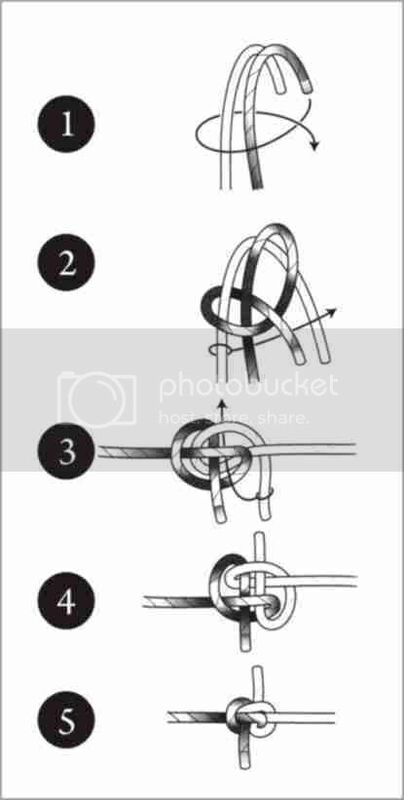 The knot does not have to be completely tightened before loading; it is secure even with daylight showing through it (4).To untie the knot, push and pull on the twin encircling bights -tap them with a mallet if necessary - until some slack is obtained. Then, bit by bit, loosen the whole arrangement. It is possible to untie Zeppelin bends that have borne loads of several hundred tonnes.